In my previous post, I discussed that I made my own bails for the pendants for my necklace project. A while ago I tested out this with sheet metal (coated copper) and showed the results in this post. 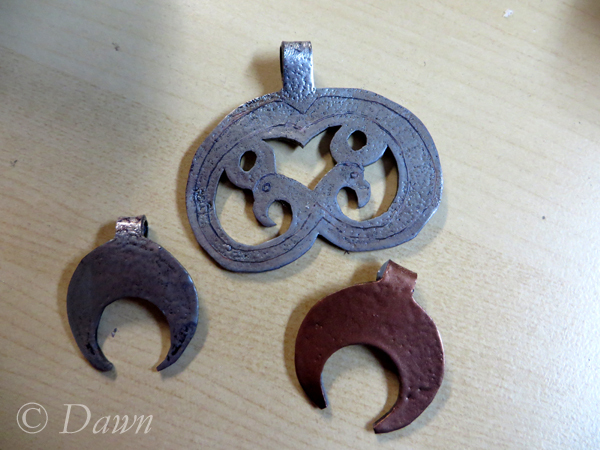 My silver arrived, so I used similar steps with the silver as I had done with the coated copper. 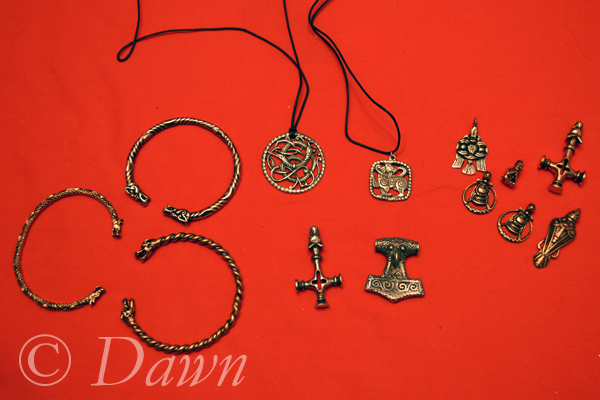 Not too long ago, I placed an order for some sweet new swag for my Viking-Age kit. It all started when I gave away my favourite Icelandic wolf-head Thor’s Hammer at an event to someone who admired it and mourned the loss of one of his own. I had a few, though when I got home I realized they were a bit different… and I felt a bit uneasy about no longer having the one I really liked. This meant… I needed to order another one. …and that led… to shopping! 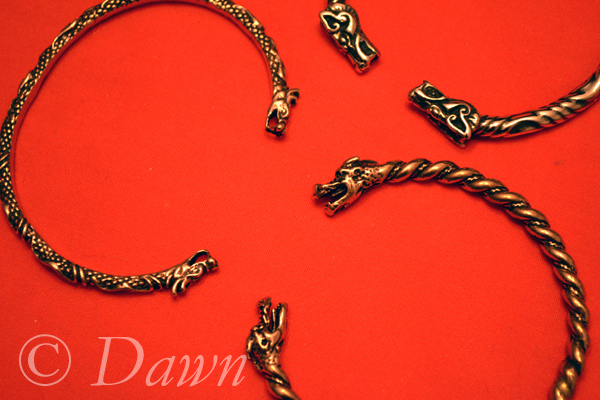 I picked up three bracelets/cuffs in a torc/torque style with animal heads (wolves and a dragon) and a number of pendants in bronze and pewter. 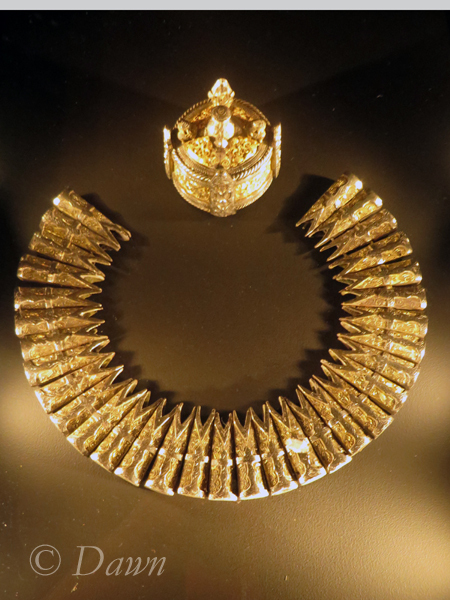 Two of the bracelets are ‘mens’ sized – and are quite thick. The other is a ‘female’ bracelet, and is much lighter and more delicate. I couldn’t decide between the wolf-head terminal cuff and the dragon-head, so I bought the wolf in ‘male’ and ‘female’, and the dragon in ‘male’. 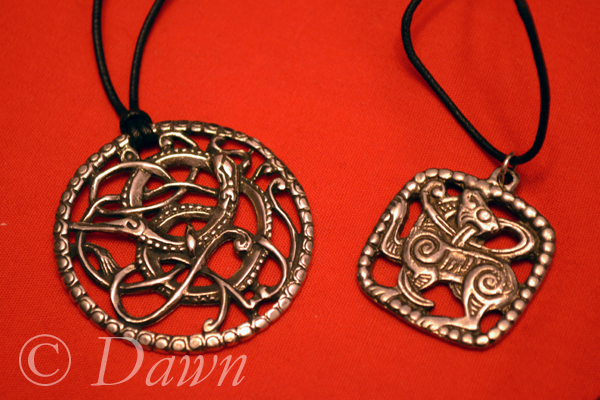 I haven’t yet looked into the design these two pendants are based on, though I think the round one is similar to the Pitney Brooch. 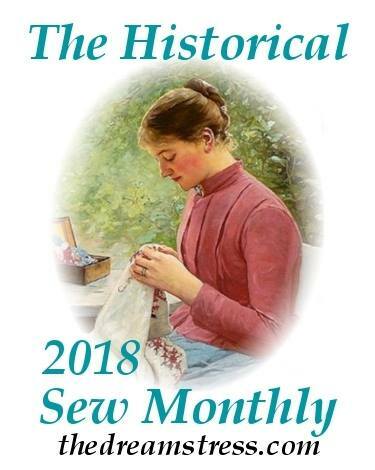 More research is needed here – though if you happen to see this and know… and can save me a step – that would be awesome – please leave a comment below! Now – I just need to find some beads and things to string these up on! 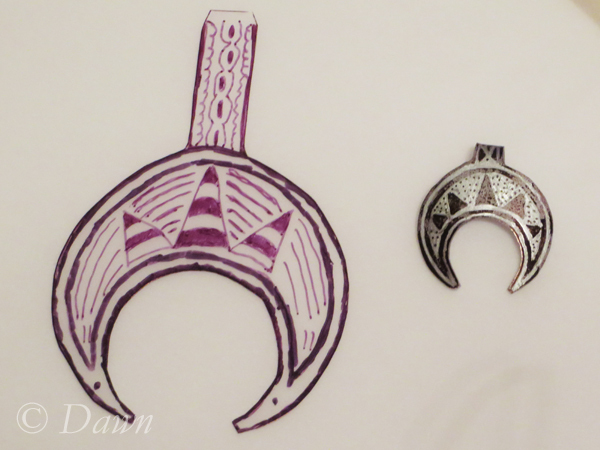 Since I was quite happy with the results of my first & second Lunula pendants, I decided to make a third, a bit more elaborate. I started with inspiration from a Pinterest pin – which included three different Lunulae – and I chose the more complicated and detailed of the three. Of course, so much of Pinterest leads to Tumblr.. and Tumblr is like the wild-west of copyright violations and lack of credit/attributions… so I had no idea of the original source. Like my previous shrink plastic projects, I used Grafix brand matte shrink plastic which starts as transparent and shrinks down to white in colour. 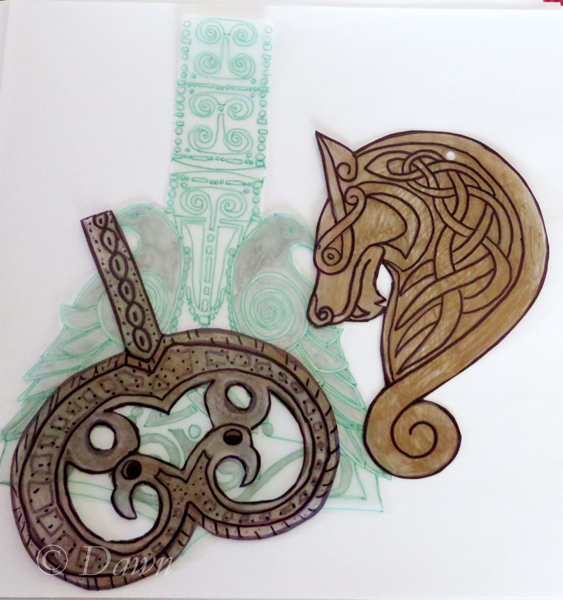 I traced the design to both sides of my plastic and used black, bronze, and silver Sharpie markers. I didn’t sand the plastic before colouring, and found that large areas of colour weren’t as solid as I wanted. Since my original Lunulae had short (about 1″) long ‘stems’ which folded over to create the ‘bail’ to attach the pendant to a chain or cord – and the resulting fold over was only enough to go around a toothpick… I made the ‘stem’ substantially longer on this version so it could easily go around a chopstick instead – and thus a larger cord. Although the finished shrunk plastic pendant was ok – the colours were nice and bold… I didn’t really feel that it looked metal. 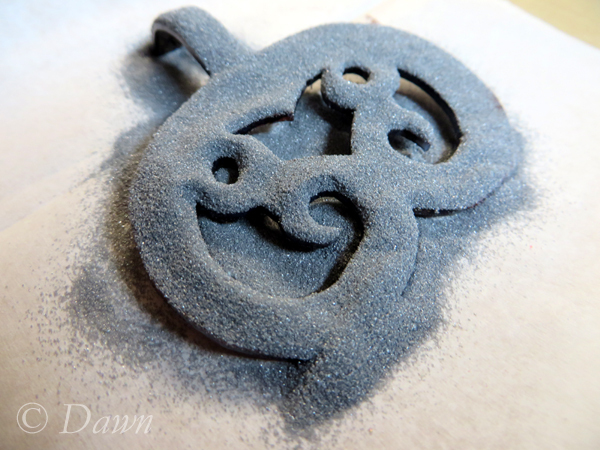 Like the other pendants, I opted to emboss this as well, using silver embossing powder. 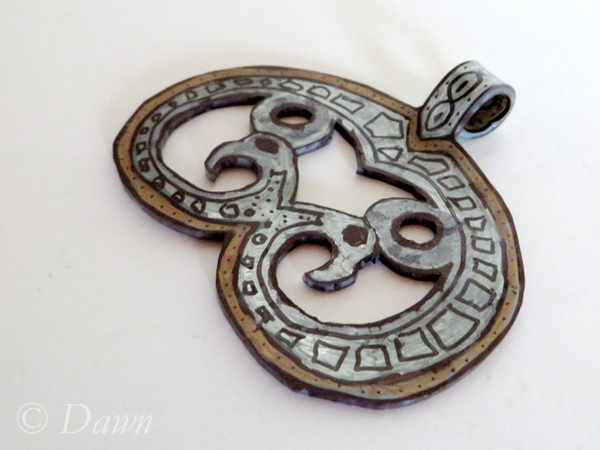 When the pendant was re-shaped and embossed, I decided to scratch some of the design back into the pendant, which I’m kind of fond of, though I might need to live with it for a while before knowing if it’s ‘right’. 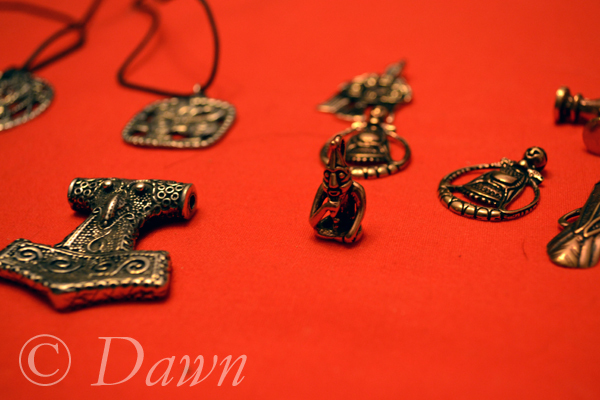 Copper pendant along with a silver one and the bird silver embossed pendant. 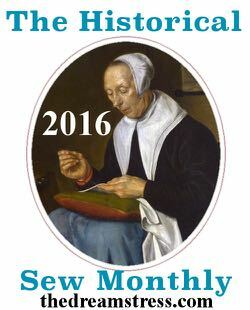 I still have a few more projects to share with shrink plastic – so stay tuned! 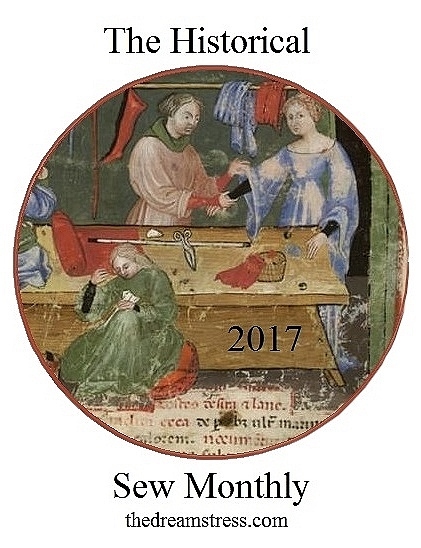 In the mean time if you have some cool inspirational links for shrink plastic – feel free to share them in the comments below! The other day I posted about trying shrink plastic… here’s the first project! 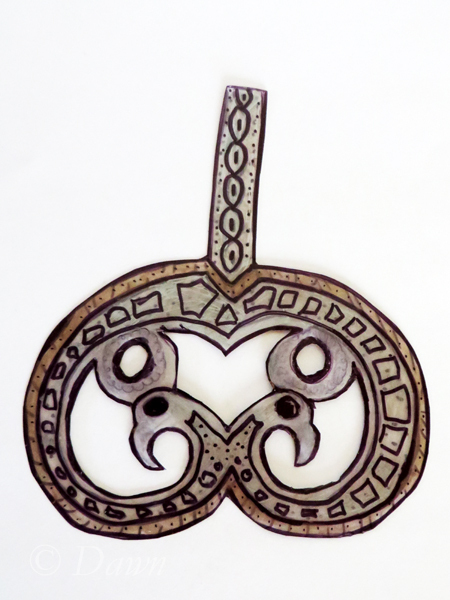 Along with some of the other Viking and Norse-inspired pendants that I’ve been able to find from various sellers, one of the icons I’ve been looking for (without much luck in a price-point I want to spend for a costume piece…) is the Lunula.